John Nelson Darby is heralded by many as the "father of dispensationalism". The Collected Writings of John Nelson Darby (52 vols.) 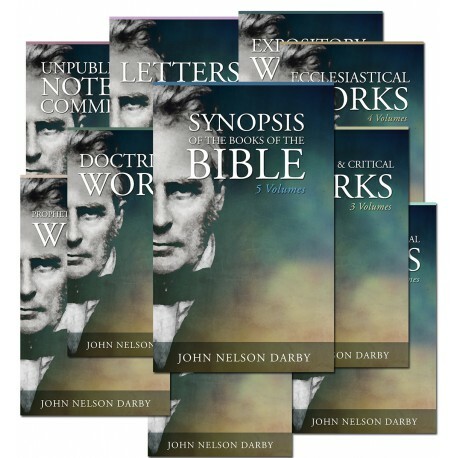 brings together John Nelson Darby's incredible output of writings. Originally printed as 5 Volumes. The Scriptures have a living source, and living power has pervaded their composition: hence their infiniteness of bearing, and the impossibility of separating any one part from its connection with the whole, because one God is the living center from which all flows; one Christ, the living center around which all its truth circles, and to which it refers, though in various glory; and one Spirit, the divine sap which carries its power from its source in God to the minutest branches of the all-united truth, testifying of the glory, the grace, and the truth of Him whom God sets forth as the object and center and head of all that is in connection with Himself, of Him who is, withal, God over all, blessed forevermore. Originally printed as 7 Volumes. Genesis. In this book we have all the great principles of God's relationship with man, without bringing in redemption which makes a people for God and a dwelling-place for God in man. You never, save in chapter 2:3, get the word "holiness" in Genesis; and you never have God dwelling with men. Originally printed as 9 Volumes. The Covenants. The giving of the Church to Christ before the worlds, and the consequent giving to us of the blessings therein involved, seem to me indeed to be most clearly declared in Scripture, as in 2 Tim 1:9,10. But little heed seems to have been given to that which is really contained in this covenant, as administered in dispensation, in its connection with the character and hope of the Church. Without weakening, then, the foundation whereon all rests, or pulling stones out of it to polish or carve for less needful and appropriate uses, while that whereon they should rest is gone, let us see the plain revelation afforded by the blessed word, on what, in their great branches, the covenants are founded. Originally printed as 4 Volumes. Communion with God€”communion with God in a new nature, being made, as the apostle teaches us, partakers of a divine nature, is both that in which eternal blessedness must have its spring, and the source of all true knowledge. Here God, through grace, can communicate with us in the intelligence of the same delights, and the communication of the same interests. The ultimate provision made for this is the incarnation; and the Lord instructs in grace (renewed in knowledge after the image of Him who created us) in all those elements of the knowledge of good and evil, by which the value and excellence and the divine provision of the Lord Jesus are apprehended and adequately esteemed, at least in principle and desire. Originally printed as 3 Volumes. I HAVE no pretension to learning or leisure, yet I have written and now present to my reader a book, the size of which, when I see it complete, alarms myself. It may be asked why I undertook such a task when I knew that I had neither. My answer is this: When any one loves, confides in, and is deeply indebted to another (and in this case the debt is infinite), he will seek to defend, if he has any heart, the beloved object when it is attacked, without perhaps exactly measuring his power to be fully successful in its defense. Thus the hope of the church is not alone salvation, that is, to escape the wrath of God, but to have the glory of the Son Himself. That in which the perfection of its joy consists is the being loved by the Father, and by Jesus; and, in consequence of this love, the being glorified. But more than this, the Father would have us enter into the full intelligence of these riches, and has even given us the first fruits by the presence of the Holy Ghost in all those who are saved. Before we follow up these thoughts by other testimonies from the word of God, let us look into the chapter before us. The Absolute. THERE can be no absolute knowledge in man by his own reason, but only relative. God only is absolute; all other existences can be only relative, because there is only God absolute. I do not think coming forth from the bosom of the Father scriptural. The reason seems to me evident, because the expression is used to express a present apprehension of His love and favor which depends on His being in that place. To come forth from it would be at best the thought of memory, and this is evidently much stronger; it is the present being in, and in the enjoyment of, what the phrase expresses. He came forth from the Father and into the world, and left the world and went to the Father, but never, I think, is it said from His bosom. But it is evidently to express an idea like Abraham's bosom in another order of ideas, not a physical fact; and man, in expressing the love and joy He left for us, may have used it in a certain sense harmlessly, namely, with right affections, though not quite accurately seizing the force of the expression in John 1:18. I may have done so myself, for aught I know. Coming forth from the Father is the point de depart, not the intimacy of affection and position. Hence we have the only-begotten Son, He who concentrates in His own Person all the affection of Him in whose bosom He is. THE ministry of John Nelson Darby is, by the Lord's mercy, so well known as to render comment unnecessary; it only remains to explain the circumstances under which the present writings are published. His executors have found, amongst his papers, a number of note books, in his own handwriting, containing many comments, notes and meditations on various subjects of divine teaching, explanatory and otherwise edifying, and have decided to set them forth for the benefit of the Church of God at large, and in the interests of the truth. It was Mr. Darby's habit to jot down, in such books, thoughts on Scripture and scriptural subjects as they occurred to him, not in any regular order, nor in view of publication; thus, the germ of thoughts, amplified elsewhere by him, will sometimes be found in the following pages, together with fresh and deeply interesting matter, such as might be expected to issue from the private study of one so richly taught in the Word. The works are accessible through the Books > General Books Menu. A view of the Synopsis of the Bible and the Books menu. The Expository Writings are also accessible as a Commentary. Darby's Synopsis of the Bible can also be accessed as a Commentary.